If you want to lose body weight fast, you can find lots of unhealthy ways to do so. 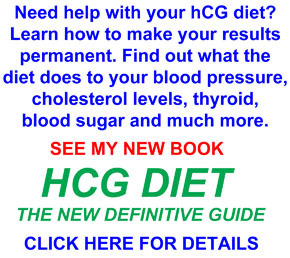 HCG hormone weight loss is better for you and faster than just plain dieting or exercise. Marketing hype makes is sound better than it really is. Here is a typical exchange that I had recently with one of my readers, which shows how expectations can undermine results. Hi Dr. Dennis, I started the 500 calorie diet 11 days ago strictly and have lost 7.6 lbs. Started with 10 drops then went to 13 bc I was getting dizzy and felt famished I am a diabetic. I have coffee no sugar but I eat an apple for breakfast. I drink water with a slice of lemon all day and weigh my food. My blood pressure and sugar have dropped. I’m losing about 1/2 lb a day. Is this normal? I don’t know why my progress is so slow I’m thinking I may have got a fake bottle of HCG. Most people have lost 1-2 lbs daily. I walk every day for about 15/20 minutes. I don’t know what Ai am doing wrong and getting discouraged. Help!!! You are doing fine. Without knowing all the details of your situation, I can say that one-half pound per day is a more common rate than you hear about from all the marketing hype. In fact, the typical loss for women is 0.5-1.0 pounds per day. The idea that “most people” have lost 1-2 pounds per day is not true. In fact, one pound per day is more common for men, and one-half pound per day is more common for women. So keep up the great job! I don’t know what to say about the number of drop you are taking, because I don’t know what product you are taking. However, the original Simeons protocol entailed the same dose for everyone. Please realize that this protocol is the best there has been for weight loss for more than 50 years. Just don’t buy into the marketing hype that makes it sound better than it really is. The original protocol is works great when you do it right.